Summer heat is becoming more and more unbearable here. People are spending more time in the malls to cool off and those that want to enjoy the heat goes to the beach for a much needed vacation. As for me, I decided to stay in my new art studio that I am still fixing and do more nail art designs using summer as an inspiration. I wanted something bright, colorful, and cheerful. Initially, I thought of creating an abstract design but I guess I'm still in the floral mode. For my base color, I chose OPI Did It On Em from the Minaj Collection. It's an apple green shade that I really like. Texture was superb, and so was the application. I applied 2 coats. I hand painted the design using acylic paints and a detailing nail art brush. I had 2 colors in mind to wear with Did It On Em -- purple and dark pink. I thought that these colors and the base color would contrast one another perfectly for each one to pop. In the end, they didn't disappoint me. To get the colors to stand out more, I decided to add black outlines. It is because of this decision that I also chose to paint simple flowers. I painted one big flower and a small one for each nail. I alternated the colors of the flowers between purple and dark pink. For some reason, my dark pink looks red in the pictures. I painted the flowers in random places just to make the design more interesting. I painted the black outline first because I find it easier to fill in shapes than to add outlines after painting a design. I then painted a coat of white acrylic before painting the colors (purple and dark pink). The white layer is important if you want your colors to appear bright and the white paint can help achieve opacity faster. Also, I've been receiving a few emails asking me if I really do nail art on both my hands or do I use a model for this nail art blog. Instead of replying via email, I think it is best to answer it here. I paint my own nails and I do my own nail art on both my hands. There are occasions that I do nail art on my sister and my mom. 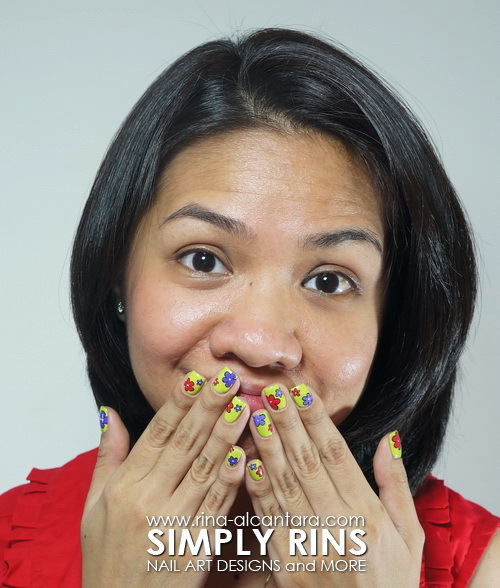 I always mention that in my posts if I feature the nail art I did for them. 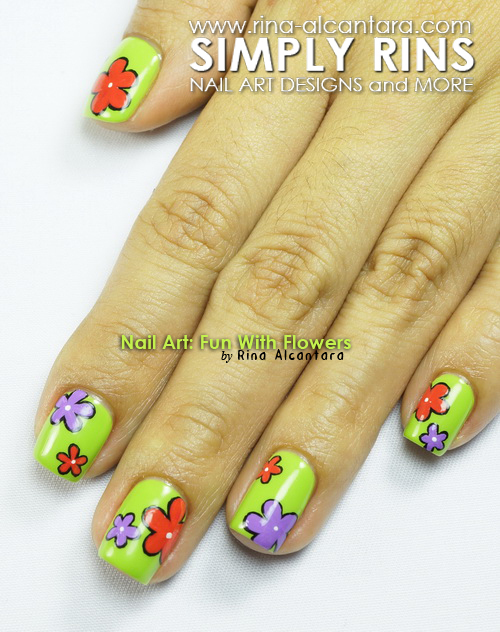 Me and my Fun With Flowers nail art. I hope you liked this summer inspired nail art design. Did you like the colors? I would love a tutorial most def !!! :)) love the design and great colors. The colors are great! Perfect combination. I'd love a tutorial as I find myself wanting to recreate every one of your nail art designs! I would love the tutorial...jsavinelli@hotmail.com. I mAke chocolates but am now fascinated to do my own nails! I have OPI Did It On Em and haven't worn it yet, but this post makes me want to put it on right away! The colors you picked for the flowers look fantastic with the green. That is so cute! 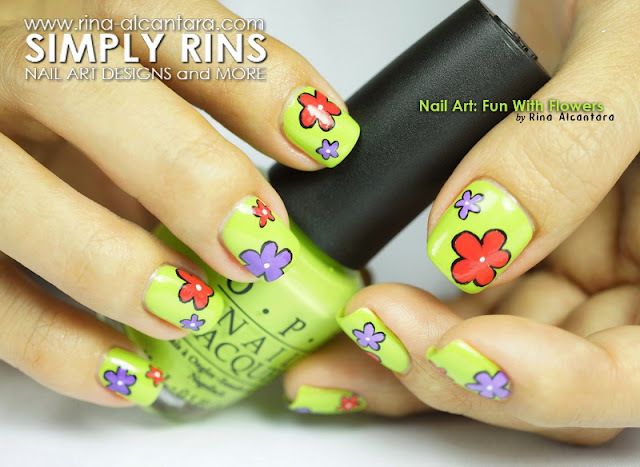 When I first saw OPI's Did It On Em I found the colour kinda weird but it works perfectly with this floral look! its very niiiice! u know Rin..no matter what I do i cant make those daisy type flowers u make..the small one stroke press-and-lift petals..jus dont come right. Is there any technique for that? The color combination is perfect! this is the first time that i read your blog and truly its awesome! you paint your nails very good as well as your blog. 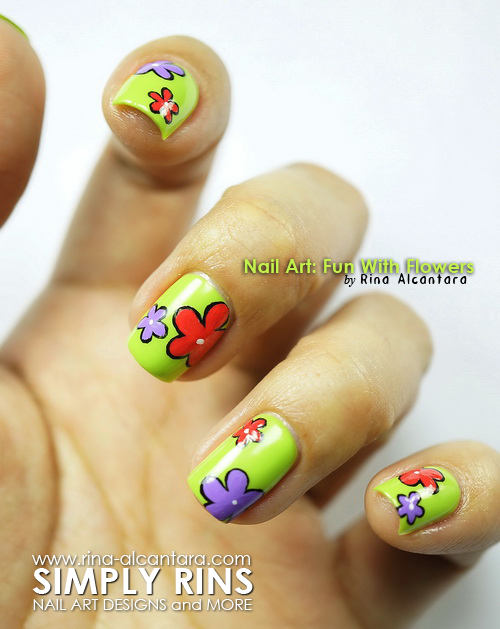 you and your nails look really cute :D such a fun floral design! Hi Rina! I love these nails! 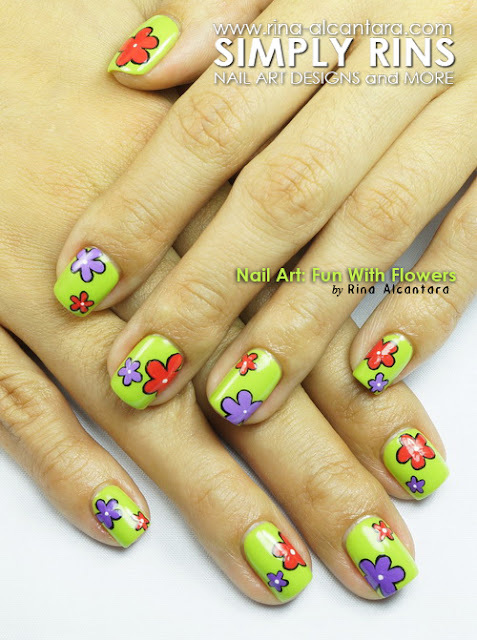 I wish I could see these nails tutorial for me to learn how you did the flowers ... You could do the tutorial? Thank you!